When George Lucas released Star Wars back in 1977, there is no way that he could have know how big the series would become. Star Wars has become so big that anybody who works on a Star Wars movie is from then on known for their work with the franchise. Whether this means actor, director, writer, or even producer, Star Wars makes everyone famous. Even controversial movies like Star Wars: The Last Jedi made a ton of money despite the fact that reviews were mixed. Even movies that get poor reviews are destined to make a ton of money because they have the words “Star Wars” in the title. The series has become so popular that anything with the Star Wars label can become collectible. Everything from Pringles containers to soda cans have become collectible because of the movie’s popularity. Throughout the years, there has been the original trilogy, a prequel trilogy, a feature-length animated movie, a sequel trilogy, and two Star Wars spinoffs. Star Wars Episode IX won’t be released until December of next year, but fans were pleased by the news that Star Wars: The Clone Wars would be coming back. Concept art is an important element of any movie. For all of the films in a galaxy far, far away, there have been several pieces of concept art that didn’t make it to the final stages of development. 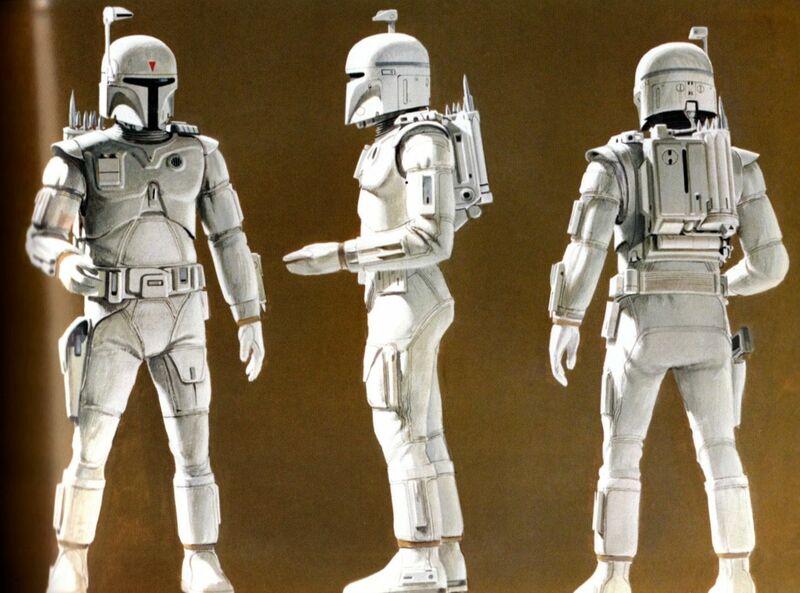 With that said, here are the 30 Unused Star Wars Concept Art Designs That Would Have Changed Everything. Darth Sidious’ apprentice in The Phantom Menace was unique in a variety of ways. Darth Maul had a double-sided lightsaber, horns on top of his head, and black and red skin. Darth Maul was terrifying in the movie, so much so that people now compare the demon in Insidious to the Star Wars character. 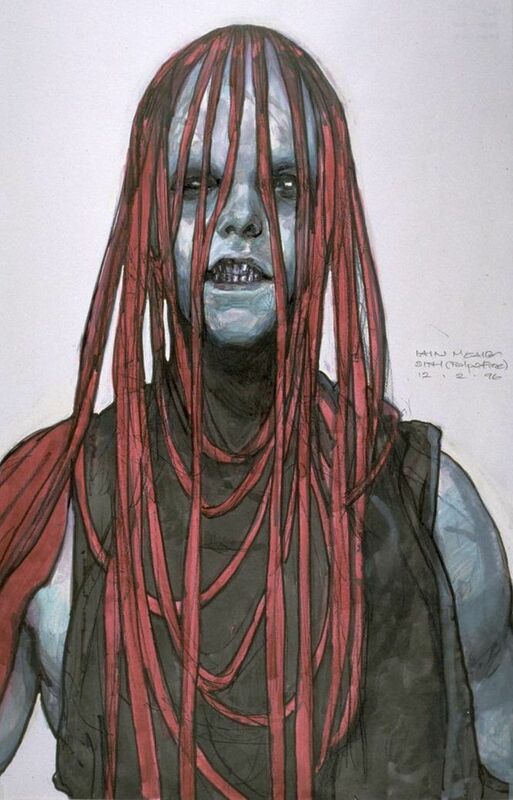 That being said, Darth Maul could have looked very, very different in The Phantom Menace. Apparently, George Lucas told artist Iain McCaig to “draw a vision from your worst nightmare” and this is what he came up with. Fans of the first Star Wars movie will remember the scene where Luke is training with Obi-Wan aboard the Millennium Falcon. Luke is using a Marksman-H combat remote, nicknamed “training remote” for short. This same training remote could have be seen in The Force Awakens, and this concept art for The Last Jedi intended to bring the tool back once again. 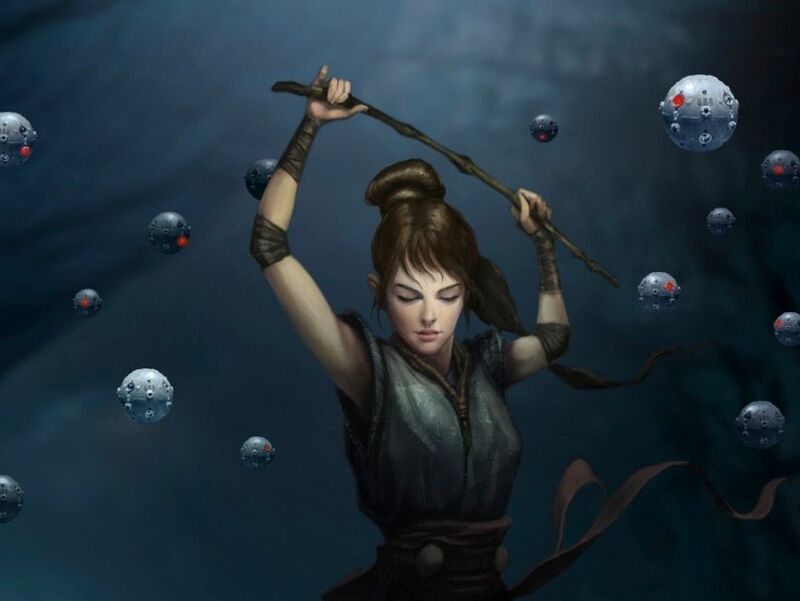 This art shows Rey practicing with dozens of training droids while she holds a stick above her head. A stick probably wouldn’t have deflected any of the remote’s blasters, but maybe this is why this concept didn’t make it into the finished movie. Wookies can no doubt be scary if you make them angry, but they almost looked horrifying all the time. While a Wookie now looks like a giant walking carpet according to Princess Leia, they originally had a lot less body hair. They also originally had pointed ears, glowing eyes, and a lot of facial hair. 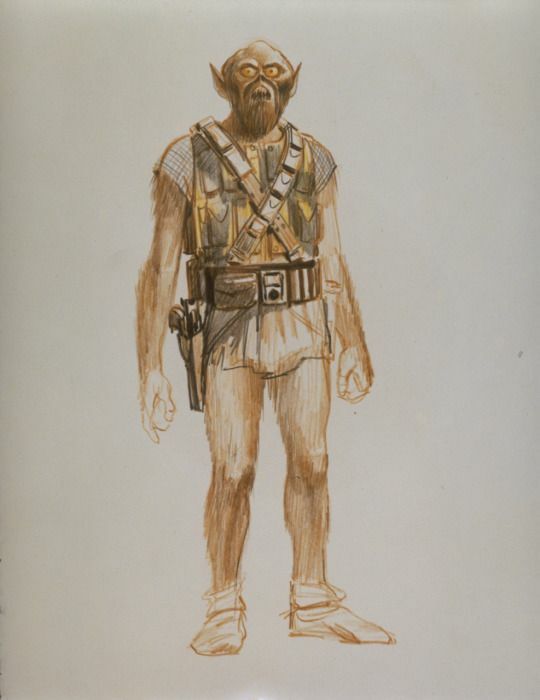 While this concept art wouldn’t be used for Chewbacca, it was used to create the character Garazeb Orrelios and the other Lasats in Star Wars: Rebels. 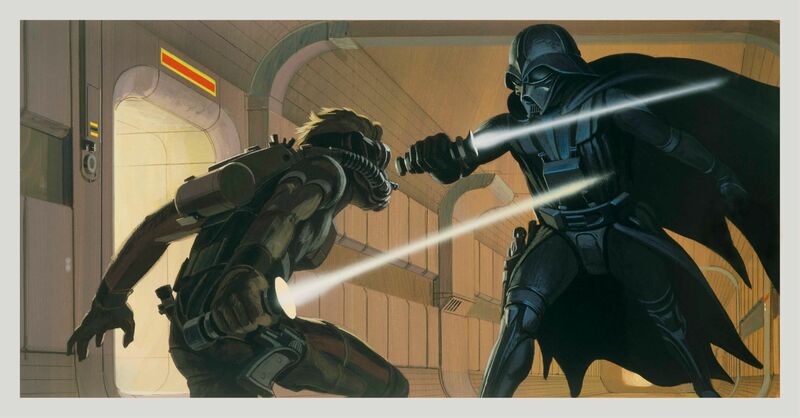 While some of McQuarrie’s concept art came out looking just like the finished product, this piece was not one of them. After Asajj Ventress was passed up as a villain, artist Dermot Power created this concept art of Count Dooku who would be played by Christopher Lee. Dooku’s appearance was altered drastically before the wardrobe department created the costume. 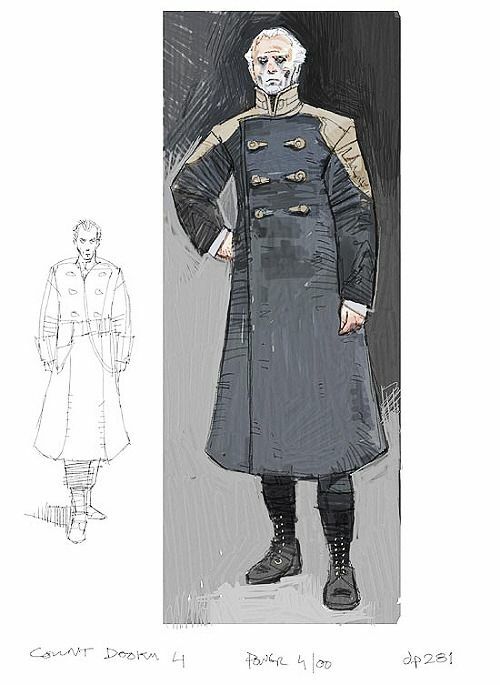 This concept art makes Count Dooku almost look like some type of sea captain rather than a Sith Lord. If this costume would have gone through, it would have not only looked strange, but it also would have felt out of place since no other Sith has ever dressed like this. C-3PO and R2-D2 were the only two characters to be featured in every movie of the original trilogy, prequel trilogy, and the sequel trilogy. C-3PO was played and voiced by Anthony Daniels, while the man inside R2-D2 was Kenny Baker. The two droids have become iconic, but they, like most characters, almost looked very different. 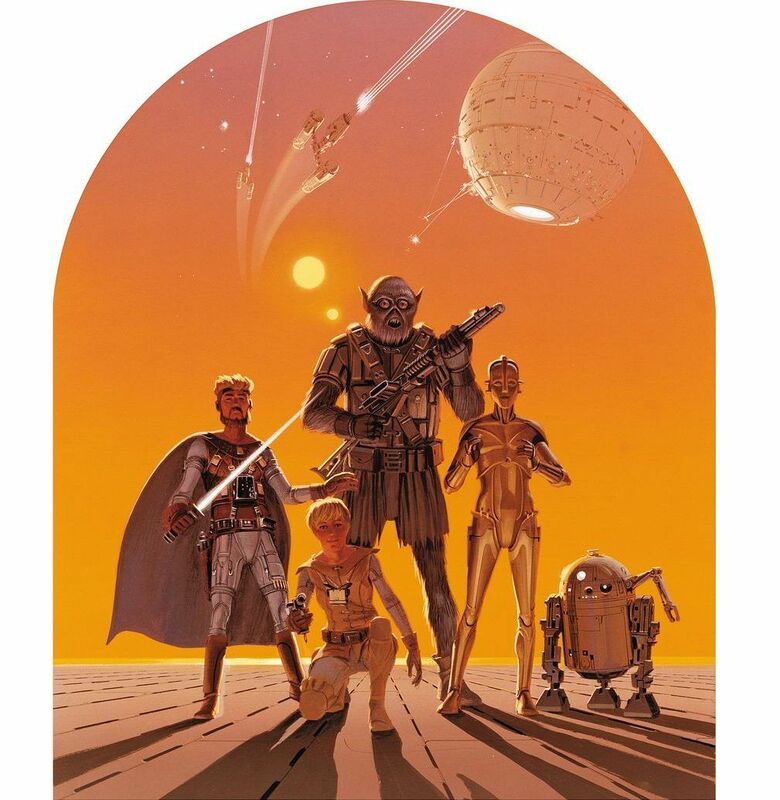 In this concept art by Ralph McQuarrie, C-3PO is very reminiscent of the robot in Fritz Lang’s metropolis. 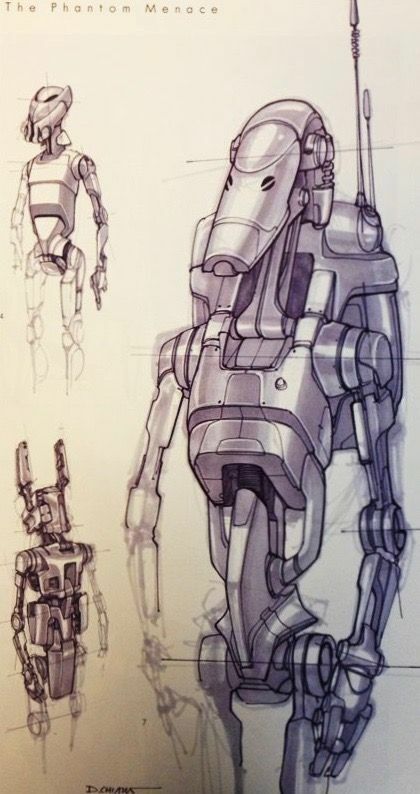 While the general look of R2-D2 remained the same, his iconic blue and white design is absent from this concept art. Yoda had an important role to play in The Empire Strikes Back. Not only was he said to be a wise and powerful Jedi, but he is the one responsible for training the hero Luke. 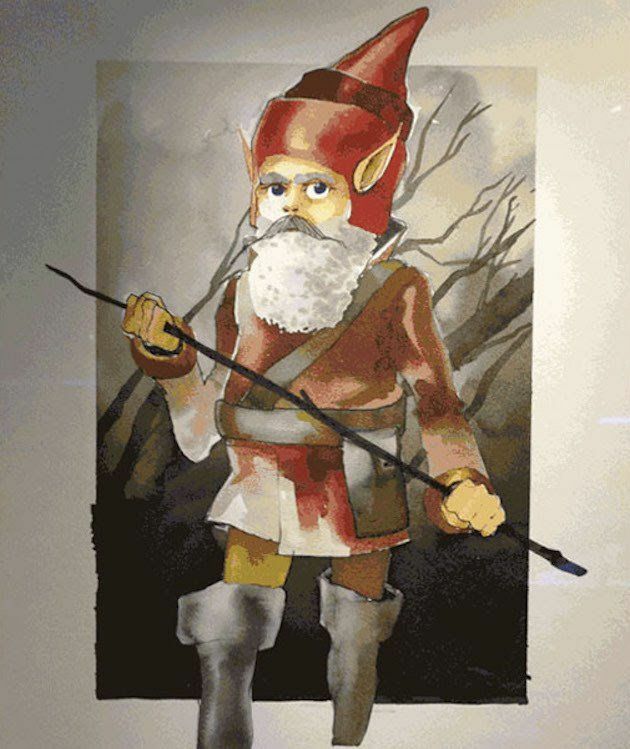 While fans have come to know Yoda as a small green creature, he almost turned out looking like a small garden gnome. Few ideas from this original sketch made it to the final movie. It would have been truly strange to see Luke carry around a Jedi who looked like this on his back, but thankfully this never happened. The Gorax are a type of species that live in the mountains of Endor. 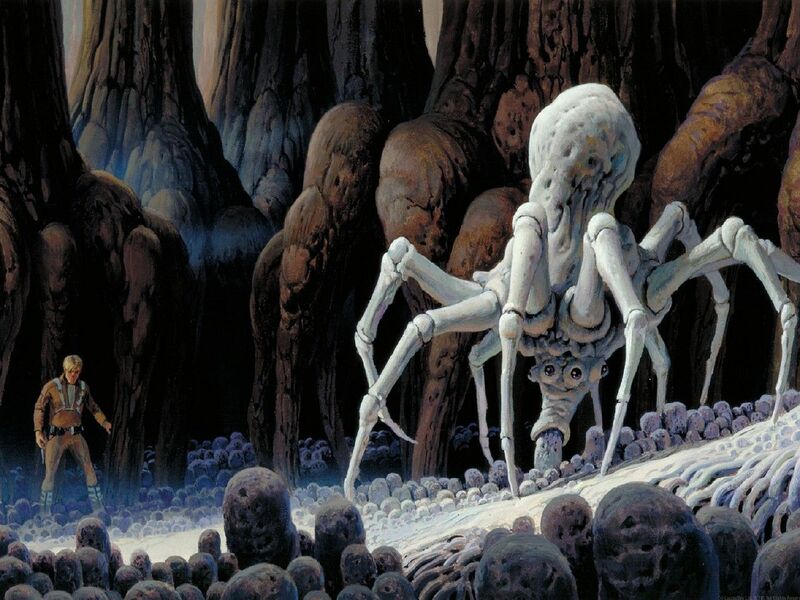 While they weren’t seen in the original trilogy, they were originally supposed to appear based on Ralph McQuarrie’s concept art. This specific piece shows a giant Gorax attacking the Ewoks. Gorax were originally developed for the TV-movie Caravan of Courage: An Ewok Adventure. McQuarrie imagined a scene where the Ewoks fight off a giant Gorax but it did not make it into Return of the Jedi. The Ewoks were very kid-friendly, so introducing a giant monster that could rip them to shreds probably was not something that George Lucas approved of. 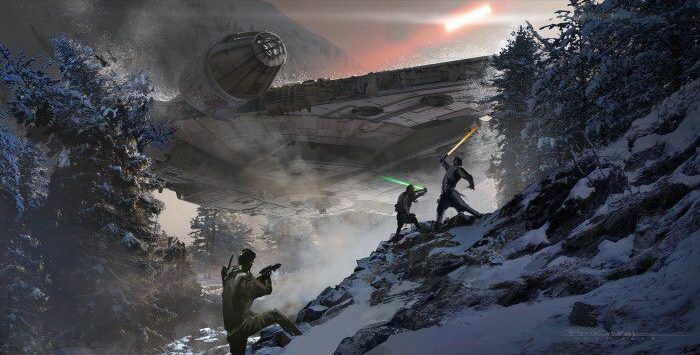 There are multiple characters present within this piece of concept art, but the most prominent is the stormtrooper. The trooper’s armor pretty much looks like it does in the movie, but what’s odd and pretty obvious is that this stormtrooper is wielding a lightsaber. In the original drafts of Star Wars, lightsabers were not exclusive to Jedi and Sith, so this explains why an ordinary stormtrooper is holding one in this concept art design. It’s also interesting that the saber has no color, so the mythos behind the Kyber crystals probably was not invented yet. This was one creature that Luke was supposed to encounter on Dagobah. The spider resembles the queen Xenommorph in James Cameron’s 1986 Aliens even though The Empire Strikes Back came out first in 1980. This design first appeared as a species called Krykna in Kevin J. Anderson’s novel Darksaber and later showed up again in Star Wars: Rebels. Anybody with arachnophobia should be happy that this concept didn’t get approved for the final movie. Fans waited 16 years for a new Star Wars movie. However, when The Phantom Menace hit the big screen, it was not what fans were expecting. While The Phantom Menace gave fans some fascinating characters, Jar Jar Binks was not one of them. In fact, Jar Jar is easily one of the most hated characters in the Star Wars universe and its not hard to see why. 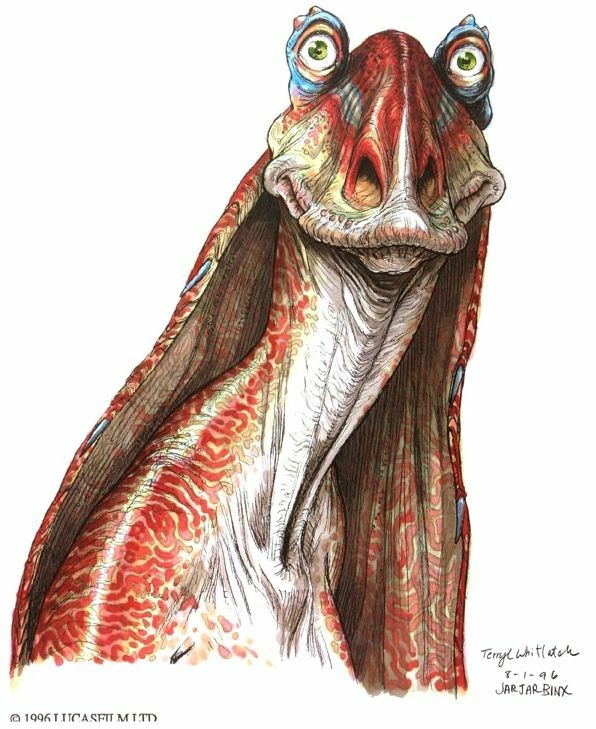 This concept art for Jar Jar makes him appear even sillier than he does in the actual movie, which is a hard task to accomplish. We’re glad that this version of Jar Jar was scrapped. For some fans, it was a dream come true when they saw Darth Vader’s burnt helmet in the trailer for J.J. Abrams’ The Force Awakens. It is later revealed that Kylo Ren, the grandson of Darth Vader, is in possession of the decrepit helmet. 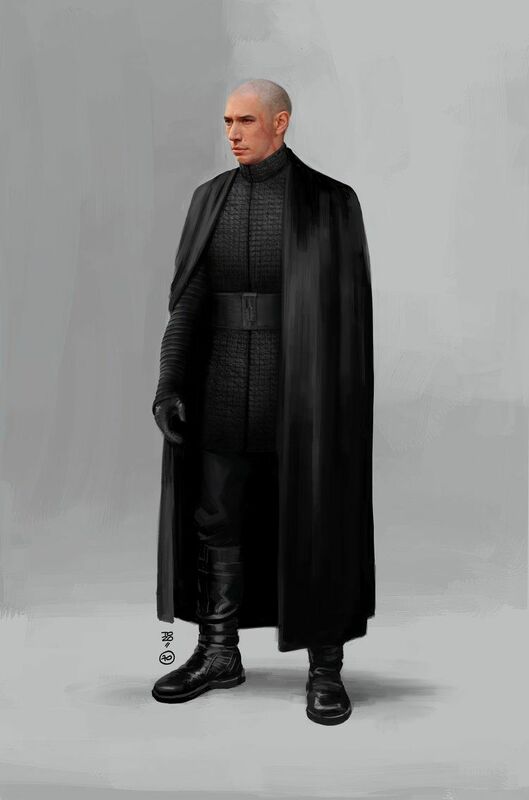 While this concept art shows a scene that was played out on screen, Kylo Ren looks very different here. This version of Kylo Ren has a prosthetic arm as well as a completely different helmet and a chest plate. Kylo Ren may be feared by his followers, but fans would have feared him much more if this version would have appeared on screen. While Boba Fett received a backstory thanks to the prequels, the character was left a mystery at the end of the original trilogy. Boba Fett first appeared during a segment of the infamous Star Wars Holiday Special and then made his first full appearance in The Empire Strikes Back. Originally drafted as a stormtrooper super-trooper, Boba later became the bounty hunter fans now know and love. Boba Fett has now become a fan-favorite despite having a limited appearance in The Empire Strikes Back and Return of the Jedi. Rogue One stood as the first Star Wars story for Disney. The movie centered around a group of rebels who tried to steal the plans for the Death Star. The film featured stars such as Felicity Jones, Diego Luna, Donnie Yen, and Ben Mendelsohn, among many others. 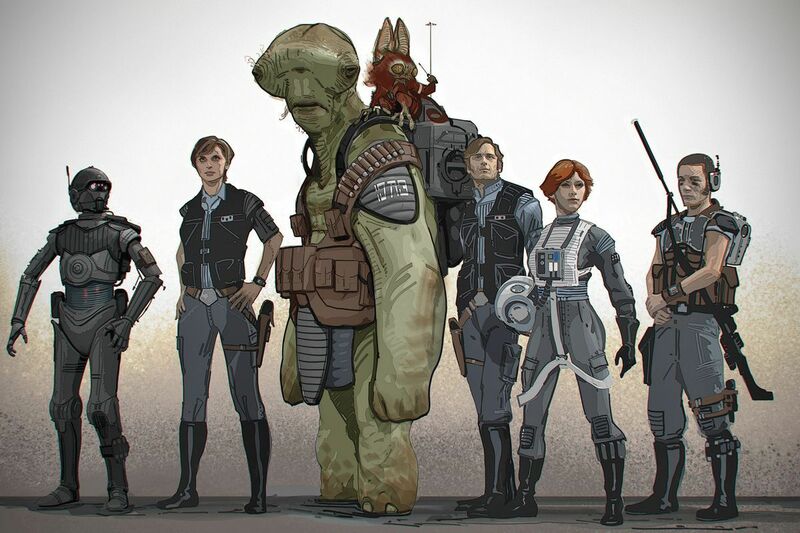 While the movie still has a big team of rebels, this concept art portrays them completely differently than they appeared on screen. All of the characters have considerable differences, but among the most noticeable is K2-SO, who looks like a black version of C-3PO. At one point during the development of Star Wars, Luke was considered to be female, as seen in this early concept art of the heroes. This group shot depicts the original designs for Luke, Han Solo, Chewbacca, C-3PO, and R2-D2. It’s also worth mentioning that Solo is seen wearing a cape and wielding a lightsaber since sabers still weren’t designated to the Jedi and Sith yet. As if the characters on the ground weren’t captivating enough, the sky is also filled with a spectacle of its own, showing what appears to be the Death Star along with other spaceships. George Lucas has made several changes to the original trilogy since the special edition debuted in 1997. Fans have been craving a re-release of the original trilogy minus the changes, but this has yet to become a reality. 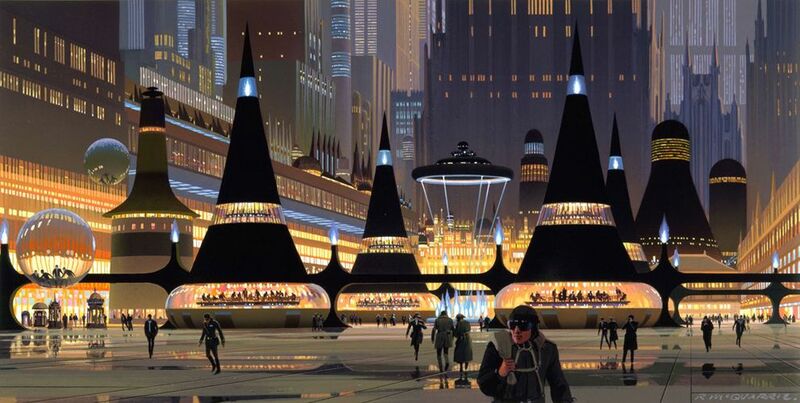 One scene that was added into the special edition was a scene showing the inhabitants of the planet Coruscant celebrating after the Rebellion defeats the Empire. 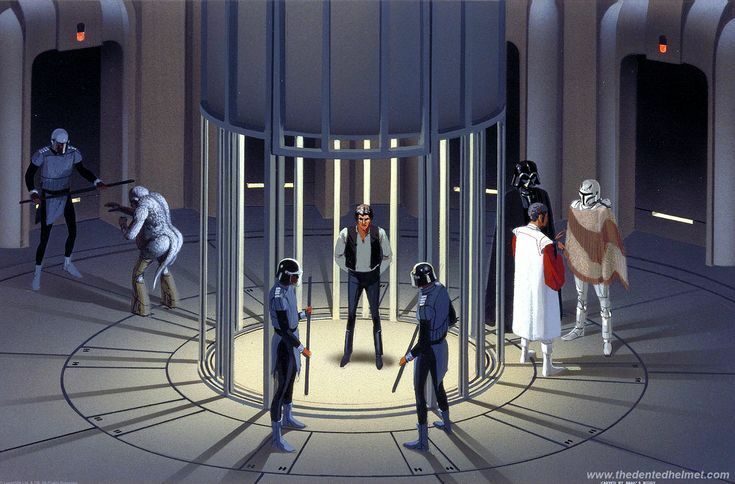 Ralph McQuarrie included this scene in his concept art for Return of the Jedi, but it didn’t make it into the final cut until 1997. Lucas more than likely added this scene in so that he could further connect the original trilogy to the prequels. After dueling with Rey at the end of The Force Awakens, Kylo Ren had a deep slash across his face from a lightsaber wound. While The Last Jedi featured Kylo with a scar to go nicely with his luscious locks, he almost didn’t have his iconic long hair. As this artwork shows, Kylo was almost bald in The Last Jedi. Rian Johnson got a lot of criticisms for The Last Jedi but he more than likely would have gotten a lot of hate if he decided to chop off all of Kylo Ren’s hair since it would have been such a drastic difference. Han Solo has a very iconic look in the original trilogy. Consisting of a white shirt, a vest, and blue pants with a holster belt, Han’s look is memorable and quite easy to cosplay. Han Solo’s appearance, however, could have looked very different if George Lucas would have gone with Ralph McQuarrie’s original look for Solo. This concept sketch depicts Han as he is about to draw his blaster. However, he looks a little different than usual. Han appears to have a brown vest with a blue shirt and grey pants. Not to mention he also has a necklace, goggles, and blond hair. The heroes’ trip to Cloud City was not exactly what they had expected, to say the least. The group was betrayed by a friend and, in turn, they came face to face with Darth Vader. Han Solo gets the worst of the treatment since he was tortured and then frozen in carbonite. This concept art shows Solo being held in a prison while two imperial guards stand in front of him, watching. It also is hard to miss Darth Vader talking with Boba Fett in a poncho and Lando Calrissian. One of the most memorable scenes in Return of the Jedi came when the Emperor uses his force lightning to electrocute Luke Skywalker. Darth Vader is forced to choose between remaining loyal to his master and saving his son’s life. 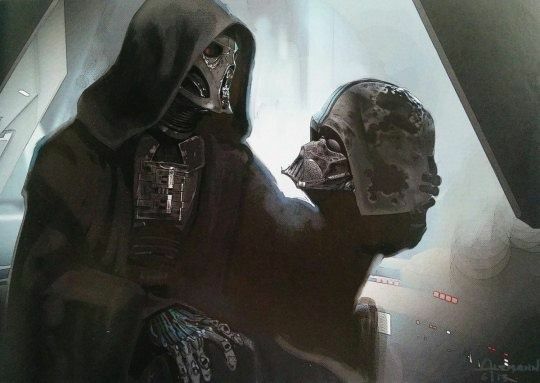 This concept art depicts this scene, but the Emperor looks very different. Instead of being an average height, Sidious looks incredibly tall, almost on Supreme Leader Snoke’s level. Darth Sidious’ eyes are also completely red, which makes him look extremely evil and menacing. His collar is also popped, which could have been his biggest crime against the galaxy. While Episode II- Attack of the Clones may not have been everyone’s favorite Star Wars movie, it no doubt had a memorable lightsaber battle in it. Most Star Wars movies have a few battles with a couple of saber-wielders, but Attack of the Clones had a massive battle on the planet Geonosis. The battle consisted of multiple Jedi coming to the rescue of Anakin, Obi-Wan, and Padmé after they were captured by Count Dooku. Not only did the Jedi fight against battle droids, but they also went up against different beasts and even Jango Fett. The prequel trilogy brought to life many species of extraordinary creatures. Some of the creature designs were better than others, but here is an example of one that never made it into the finished movie. 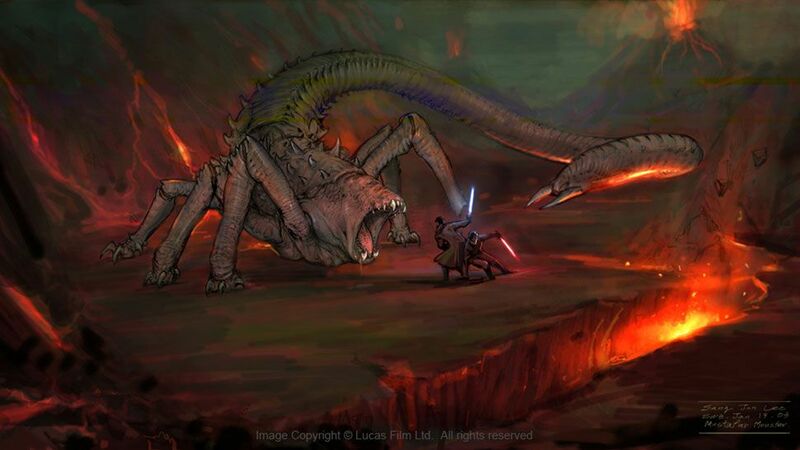 The scene depicts what appears to be a Jedi running away from giant worm-like creatures. The giant creatures almost look like Sand burrowers, only they are much larger and surrounded by ice instead of sand. This scene may not have made it into Revenge of the Sith, but this might have been for the best since there were a lot of other things going on in the movie. The set design used for Luke and Vader’s final battle is not easily forgotten. The lightsaber battle takes place in front of the Emperor while they are all on the Death Star, but things could have been very different. 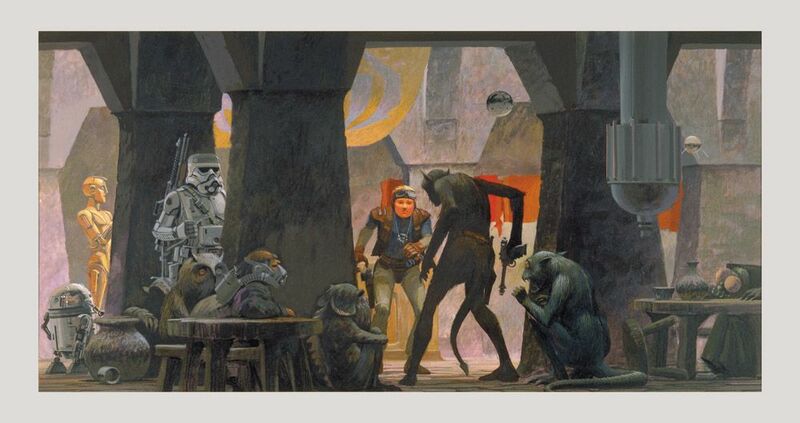 This concept art shows Luke entering the Emperor’s lair, which appears to be in a cave that might’ve been hidden within a volcano. It’s also worth mentioning that the Emperor is wearing all white even though the Sith usually wear black clothing. This obviously did not end up in the final version of Return of the Jedi, and thankfully so. We’re sure that Darth Vader would have been uncomfortable surrounded by all of that lava. While the original trilogy contained Stormtroopers, The Phantom Menace had battle droids to protect the Trade Federation. A battle droid was no match for a Jedi, but when they attacked in numbers, it was a different story. 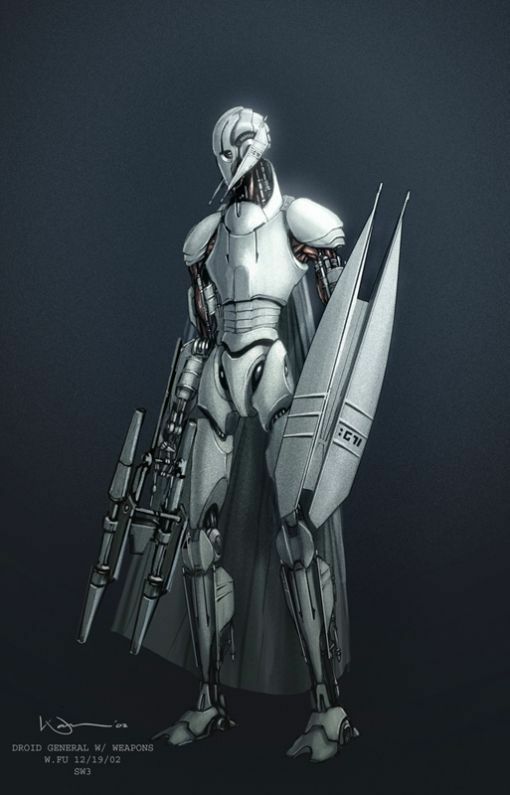 This concept art shows the final form of a battle droid, as well as two other sketches on the left. Love or hate the prequels, the battle droids have a signature look that could have been drastically altered if either of the two sketches on the left would have made it into the final stage of development. Before Count Dooku was made the villain of Attack of the Clones, the character Asajj Ventress was created as a potential Sith adversary. Ventress was created from scratch as a bald female Sith, but she was ultimately replaced with Count Dooku. Ventress eventually did make an appearance in the television series Star Wars: Clone Wars and later on in many books and video games. Christopher Lee may make for a good villain, but Episode II could have been a very different movie if Asajj Ventress was the main villain. Darth Vader and Emperor Palpatine may have been the true villains of Episode III, but General Grievous certainly was an enemy of the Jedi. Classified as a General of the droid army and a warlord, Grievous was almost completely cybernetic. He collected the lightsabers of the Jedi who he took down and even wielded four at once during the movie. 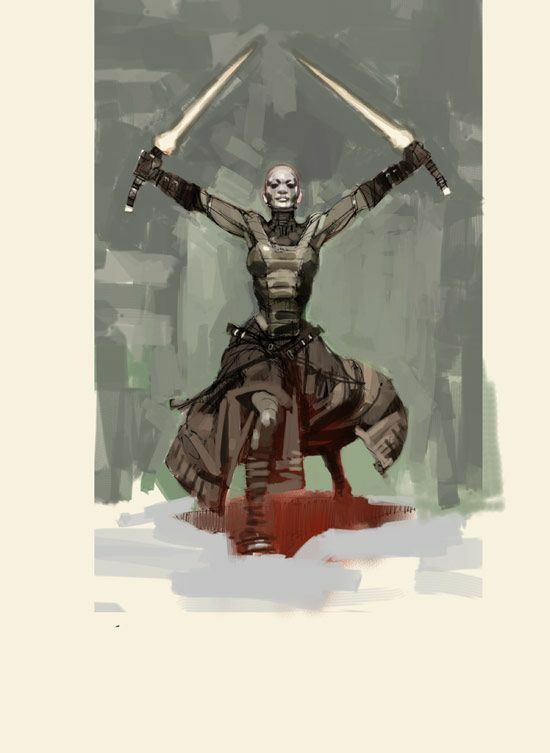 This concept art by Warren Fu depicts a much sleeker version of Grievous in clean white armor. He is also wielding a shield and some sort of an electropole. Needless to say, Obi-Wan would have had a much harder time shooting his heart if he had this upgraded armor. Even though Darth Vader turned to the Light Side before he passed on, he still had a huge influence on Kylo Ren. Kylo idolized his grandfather and wanted to finish what he had started. 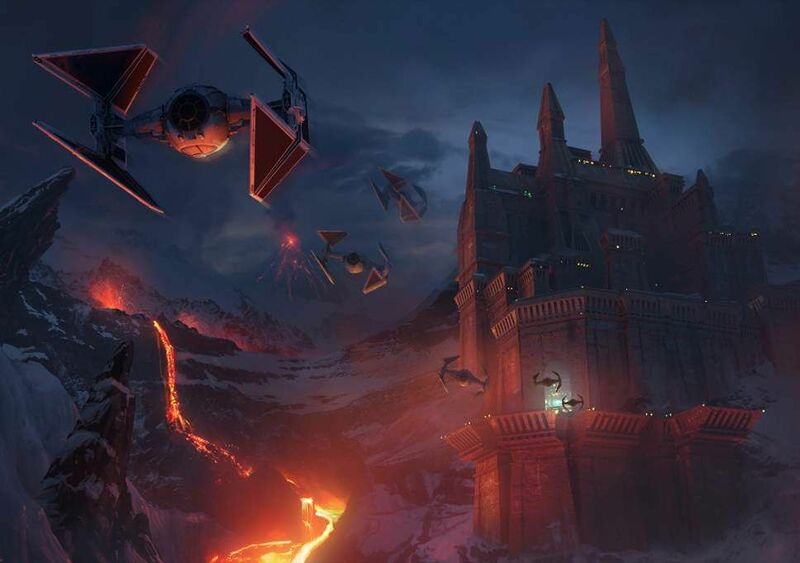 Concept art for The Force Awakens shows a castle that was built for Darth Vader. The castle made an appearance during Rogue One: A Star Wars Story, but there is no telling what the story behind it could have been for The Force Awakens. Could Kylo or Snoke have run operations out of the castle? The theories are endless. Solo: A Star Wars Story has had a tough time with critics and an even tougher time at the box office. Giving Han Solo a backstory may have initially seemed like a good idea, but people were not very fond about recasting iconic characters like Han and Lando. 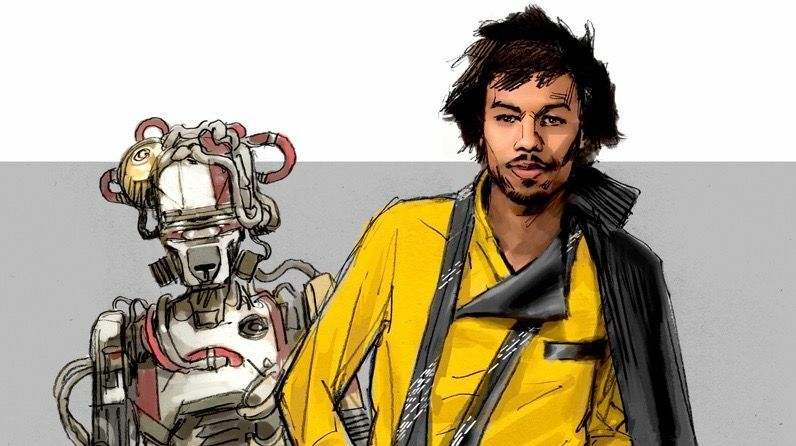 This concept art of Lando pretty much captures the clothing that Donald Glover wears in the movie, but his hair looks very different. Here it is long and messy. This version of Lando looks much scruffier than the final version, not to mention his droid is also completely different than L3-37. One of the most famous scenes within The Empire Strikes Back is the epic showdown between Luke Skywalker and Darth Vader on Cloud City. Not only is it a stunning lightsaber battle, but it is also the moment when Luke loses his hand and discovers the truth of his parentage. Darth Vader’s concept art looks pretty much the same, except for the blaster on his hip, but Luke looks very different from the final version. Luke is depicted wearing a face mask and oxygen tank. While the concept art looks intriguing, it would have been hard for Mark Hamill to get emotions across to viewers if they couldn’t see his face. The battle of Mustafar was crucial to the plot of Revenge of the Sith and was an important factor for character development. After all, Lucas had to show why Anakin needed the Vader suit. The battle between Obi-Wan Kenobi and Anakin Skywalker had been in the making for a long time. It took place on the fiery planet of Mustafar. Having two powerful Jedi battle it out was a spectacle enough, especially since they were surrounded by lava and fire. However, throwing in giant creatures such as this one probably would have been seen as too much. There have been plenty of lightsaber battles throughout the Star Wars saga. One of those battles took place between Rey, Finn, and Kylo Ren near the end of The Force Awakens. While the production was kept tightly under wraps, concept art for The Force Awakens still managed to leak. One sketch depicts the aforementioned lightsaber battle only with slight differences. In this piece, the lightsabers are different since Kylo’s doesn’t have the crossguards. There also seems to be a green lightsaber in use. The Millennium Falcon is seen nearby in the movie, but not as clearly in the background as it is in this original sketch. 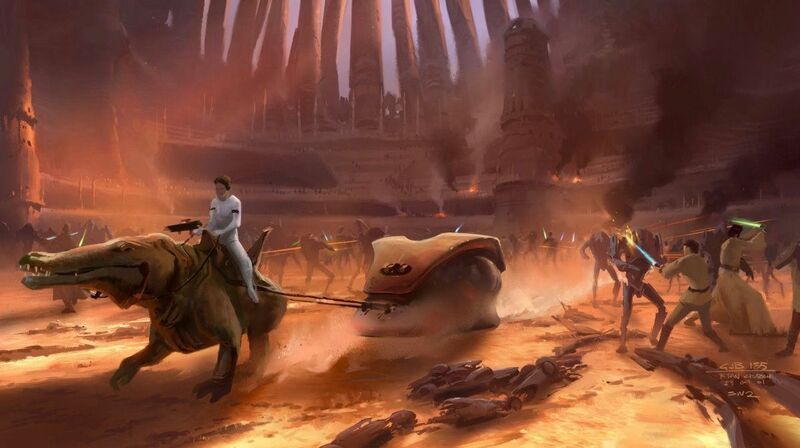 Would you have prefered to see any of these Star Wars concept art designs on the big screen? Let us know in the comments!